Category Archives: How Was The Game? Things didn’t start out very well on Tuesday, as Justin Verlander (3 GS. 17.2 IP, 5.09 ERA, 6.95 FIP) couldn’t find the strike zone and surrendered three runs in the first three innings, digging an early hole. The Tigers got one back in the 5th on a James McCann double and then added another in the 7th to pull within one. Unfortunately, they gave a run back in the top of the 8th and things looked bleak. And then, JD Martinez came to the plate and did that thing where he ties the game with a home run. Fast forward to the 14th inning, and we have one of the weirdest plays of the year. With a man on first, Davis just missed catching a ball in the RCF gap. The runner, Gorkys Hernandez thought he caught it and started to go back to first, forgot to retouch second, and wound up out on an appeal. Naturally, Gorzelanny gave up the lead one batter later. Not to be outdone, Kinsler and Miggy singled in the bottom half and VMart grounded into a double play to end it quickly. Alfredo Simon (14 GS, 85.2 IP, 3.57 ERA, 3.93 FIP) later today. The Moment: JD Martinez game-tying home run. It didn’t look good. It didn’t look good at all. David Price (16 GS, 110 IP, 2.62 ERA, 2.89 FIP) had given up four runs in six innings and the bats hadn’t done anything. And then, just like that, this happened. McCann singles. Iggy walks. Gose singles. Kinsler HBP. Now Cabrera’s up in a huge spot, but strikes out. 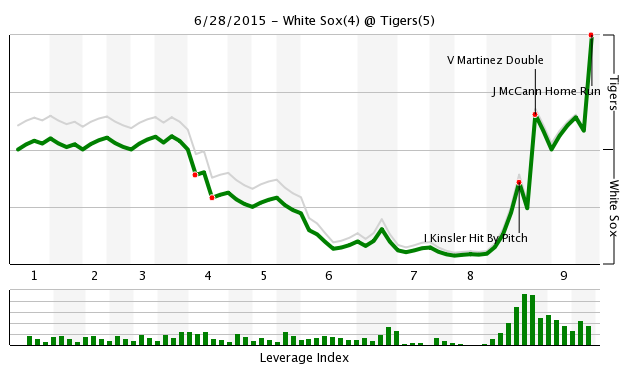 That’s why you have VMart, though, who doubled in everybody and tied the game. Soria worked a perfect 9th and then after a Castellanos punch out, McCann finished the rally he started with a walk-off home run to complete the series win. They’ll take a day off and then lean of Justin Verlander (2 GS, 11.2 IP, 6.17 ERA, 7.65 FIP) on Tuesday. The Moment: McCann sends everybody home. It was another one of those Anibal Sanchez (16 GS, 105 IP, 4.63 ERA, 4.39 FIP) starts where he gave up three home runs but everything else was fine. It’s a weird problem to have, but fortunately his hitters kept responding. The first two responses were Cabrera and Iglesias, and then it was Cespedes into triple’s alley to make it 3-2 Tigers. After the Sox tied it and retook the lead, it was Rajai Davis clearing the wall to tie it and JD Martinez crushing one put the Tigers ahead for good. We saw good Rondon and Soria pitched out of trouble to even up the series at one game a piece. Kyle Ryan (3 GS, 23.2 IP, 4.56 ERA, 5.39 FIP) will go on Saturday. The Moment: JD Martinez crushes the game winning homer. The 5th inning is where this game was won. It was 1-1, courtesy of an Andrew Romine (!) home run when he Tigers fell backwards into a six run inning. Romine started it off with a double, and then Davis and Kinsler worked a pair of walks to load the bases with one out. Danny Salazar got a weak ground ball from Cabrera to set up the double play, but he botch the play, opening the door to a pair of singles and a double. That was the all the offense David Price (15 GS, 104 IP, 2.42 ERA, 2.82 FIP) would need, as he wen 6.2 strong innings in pursuit of the series win. It looks like it will be Buck Farmer (1 GS, 5 IP, 12.60 ERA, 8.51 FIP) Wednesday afternoon in lieu of Verlander. The Moment: Tigers push through in he 6th. It wasn’t exactly Kyle Ryan’s (3 GS, 23 IP, 3.91 ERA, 5.54 FIP) finest night, but that’s okay because Miguel Cabrera and Yoenis Cespedes did the thing where they get on base a lot. Cabrera had two hits and two walks, while Cespedes collected three hits, including a line drive homer to right center field. 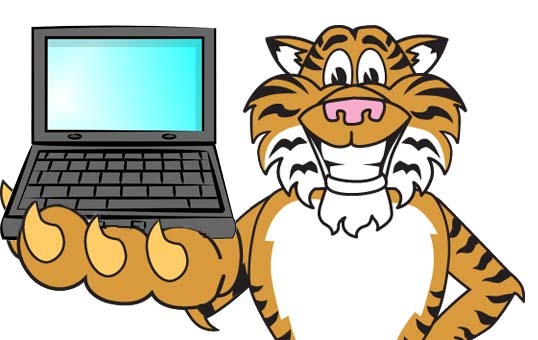 Iglesias played it smooth to start a couple of double plays and the bullpen, save for solo dingers allowed by Joba and Joakim, held things in check to allow the Tigers to coast to a nice victory. David Price (14 GS, 97.1 IP, 2.50 ERA, 2.94 FIP) will try to secure a series win on Tuesday. The Moment: Cespedes clears the fence on a line. After a rough opening to the series, the Tigers slammed their way to a salvage game on Sunday. Anibal Sanchez (15 GS, 98 IP, 4.59 ERA, 4.15 FIP) had one rocky inning, but was otherwise solid. He didn’t need to be, however, as he got plenty of support from single homers from Victor Martinez and Andrew Romine and three home runs from JD Martinez. It was a comprehensive victory after a pair of disappointing performances and the Tigers will head to Cleveland looking to keep the bats rolling. On the pitching side, they’ll turn to Kyle Ryan (2 GS, 19.1 IP, 3.26 ERA, 5.69 FIP) on Monday. The Moment: JD Martinez puts three into the seats.